Mahesh Babu And Namrata Shirodkar Celebrate 13th Wedding Anniversary In The Most UNIQUE Way! Mahesh Babu and Namrata Shirodkar celebrate their 13th wedding anniversary in the most UNIQUE way! The actor couple who are known for being extremely grounded and simple chose a unique way to celebrate their 13th wedding anniversary. It’s indeed commendable that in this time of all show-shah and razzmatazz, there are several actors down south who are still grounded. And when it comes to celebrations, they never forget to thank the underprivileged. That’s what south superstar Mahesh Babu and Namrata Shirodkar did on their 13th wedding anniversary. The actor couple who are known for being extremely grounded and simple chose a unique way to celebrate their 13th wedding anniversary. They offered food to 600 blind students belonging to the Devnar school of the blind. But before we tell you how Mahesh Babu and Namrata Shirodkar celebrated their 13th wedding anniversary, let’s have a look at how Namrata wished her husband Mahesh on the special day. And that was all about the celebrations they had on their anniversary. 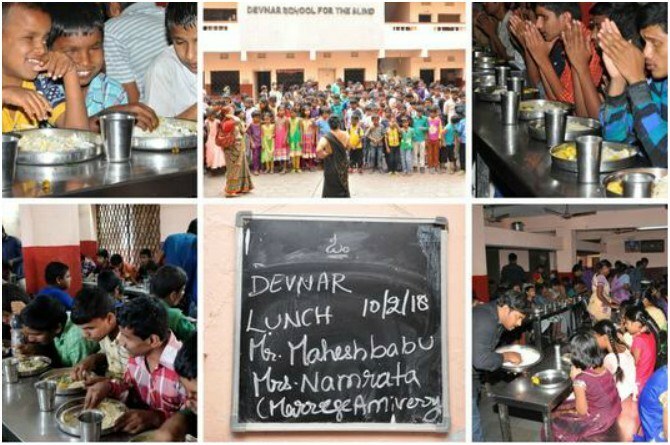 After that, team Mahesh Babu offered food to about 600 blind students from the Devnar blind school. However, let us also tell you that this is not the first time that Mahesh Babu has done a charitable deed to mark a special occasion. On wife Namrata’s birthday as well, the superstar organized a special multispeciality camp in Burripalem with the help of Andhra Hospitals. Mahesh had posted on Facebook about the same. The actor had also wished his wife on Twitter and mentioned how special Namrata was for him. “One more reason to tell you how special you are! Happy Birthday to my love, my best friend, my wife”: he wrote on Twitter. He also posted a super sweet picture of the couple with their kids, Sitara and Gautham. Once again Mahesh Babu and Namrata Shirodkar have set an example on how make a celebration memorable for others. There are several ways in which couples can celebrate their wedding anniversary, besides just throwing a lavish party. 1. Going down the memory lane by visiting the places where you had gone for your honeymoon. 2. Celebrating the day with the underprivileged like Mahesh Babu and Namrata Shirodkar. 3. Just spending the day in each other company listening to your favourite songs or talking about things you love doing together. 4. If you’re adventurous then going for a trek or camping is another unique idea that you give a shot. WOW! Alia Bhatt's new home is as spunky as her!